Want to help students in need have access to effective educational tools? Donate a game to a student or school who needs it the most! Research shows that educational games are transforming the way children learn. In fact, learning through online games strengthens a student’s memory, computer skills, and problem solving abilities – and in the case of 7 Generation Games, improves their math scores. Your donation can make a huge difference in a student’s educational experience. Whether you donate an individual license, a classroom license or sponsor an entire school, your donation will leave a lasting impact on a student. Follow these easy steps to donate a game! Step 2: Select the game(s) you want to give. Simply click on the picture of the game you want to donate and how you want to donate that game – to an individual student in need, a classroom, or a school. You can learn more about our games by reading our products page. 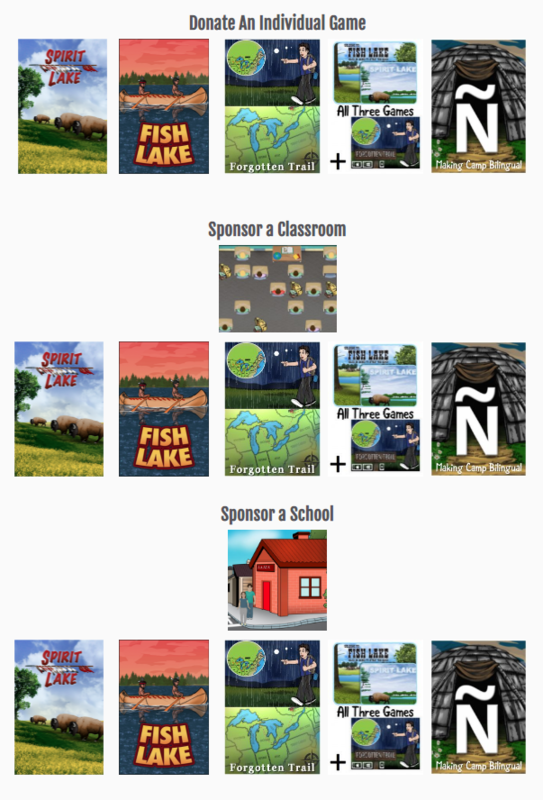 If you are interested in donating multiple games, click the “All Three Games” bundle picture, which is three games for the price of two, under any of the three options – individual, classroom, or school. Step 3: Enter the number of games you want to donate. You will be taken to another page where you can fill in your contact information and billing address. 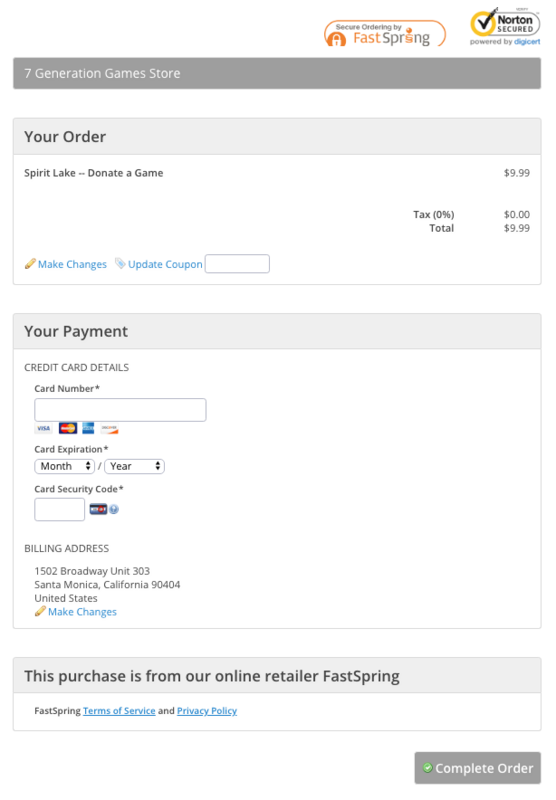 You will get a receipt emailed to you saying that you have donated/sponsored a game. Because you are donating a license, you will not get the email to download the games – we will send that to the donation recipient. 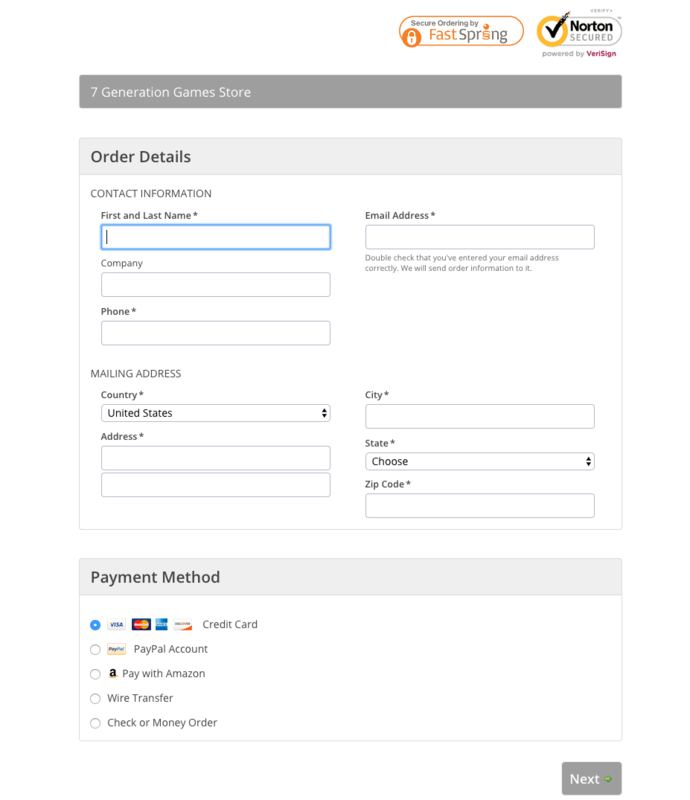 If you have a site in mind for your donation, please email info@7generationgames.com with the donation site’s information so we can make sure they get it. Please include program name (and contact email if you have it). If you are unsure who to give a game to, we have a waitlist. Feel free to read about how we give out our donated games. On the next page, depending on your method of payment, you will be prompted to insert your credit information or login to PayPal or Amazon to pay. If you are paying by wire transfer or check/money order, you don’t have to fill this out. After reviewing your order, click on “Complete Order.” You will receive an email with your order details. As mentioned, if you have a site in mind for your donation, please email info@7generationgames.com with the donation site’s information so we can make sure they get it. Otherwise, we will make sure it goes to a site or student that can benefit from your generosity. At 7 Generation Games, we know we can’t solve all of the problems in the world, but we can help make kids better at math. And we know that better math scores open doors to better futures. Thank you so much for helping us do just that!